Cajun food always smells and looks so good to me, but being a somewhat picky eater, a lot of the recipes call for things I am not a big fan of...like onions, seafood and used to be celery. I always had this thing that I was not going to like celery in things so I just never put it in anything. I decided to try putting it in this gumbo recipe and I actually really liked it. I think I have just had overcooked celery before and it seemed slimy and mushy to me. I am also not a seafood fan. I am recently starting to somewhat like shrimp. It definitely has to be in a sauce or have some sort of seasoning on it for me to even taste it. So since this was going to be in a sauce I decided to add the shrimp to the pot. Phil ate the shrimp for the most part. I did try one and it was pretty good. Still not sure if I want to eat a whole bowl of them though, ha! I am starting to become more willing to give the Cajun recipes a try and when I do, I always really enjoy them. This recipe was a really easy rendition of gumbo. Traditional gumbo takes hours to make where this only took about 45 minutes. The only changes I made in the recipe were that I used red bell pepper instead of green bell pepper, I used crushed tomatoes instead of stewed tomatoes and no onion of course! This recipe did not have the rich, deep flavor that traditional gumbo has, but it was still really good. Phil absolutely loved this one. It was a good fall comfort dish. Combine flour and Cajun seasoning in a plastic bag. Add chicken a few pieces at a time and shake to coat. Reserve excess flour mixture. In a large saucepan heat oil over medium heat. Add chicken and brown on all sides. Remove and set aside. Saute celery and garlic for 5 minutes. Add reserved flour mixture and cook 1 more minute, stirring frequently. Add tomatoes, chicken broth, and bell pepper. Bring to a boil. Return chicken to saucepan and add shrimp. Cover and simmer over low heat for 30 minutes, or until chicken juices run clear, stirring occasionally. this looks like a really great simple gumbo. 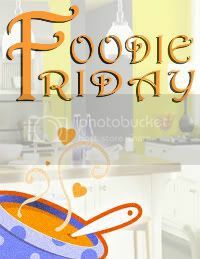 I would love it if you shared it on foodie friday today. thanks for bringing it by. Looks like a delicious gumbo! Thanks for sharing on Foodie Friends Friday. Please come back and VOTE on Sunday!